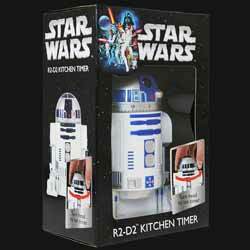 The R2-D2 Kitchen Timer is perfect gift for the Star Wars nut in your life. There's not really a lot to it, it's uses exactly the mechanism involved for any other kitchen timer. 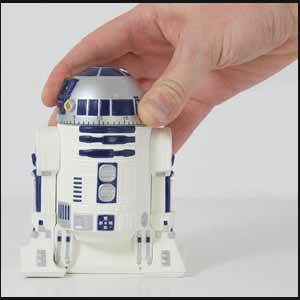 So, some fans may be disappointed that RD-D2 doesn't beep of whistle when the time is up; we get the standard bell ringing that comes with almost all formats. Still, it's nicely detailed and will look cool sitting on your kitchen work top. It's quite large for a kitchen timer, being 14cm (approx) tall. While it's far from an essential purchase, those wanting to spice up their bachelor pad would be foolish not to pick this up.